To steal a line from the Aussie movie classic, The Castle, “How’s the serenity?” Because when you install a water feature under or near your Sydney patio that’s exactly what you’ll achieve. But serenity isn’t the only reason to install a water feature. Water features also provide a great focal point and add visual charm to any outdoor living area, whether it’s a Sydney patio or verandah in Broken Hill. Imagine enjoying a coffee or cold beverage with a beautiful water feature trickling away nearby? There are many different styles of water features to choose from. There are the more elaborate, such as rock formation waterfalls and large water walls, right down to a simple water pot or fountain. Budget will play a part in which you choose, but also think about your house and surrounds. A bush block lends itself to a more natural feature, such as a rock spillway, while a contemporary water feature will look great in a modern backyard. 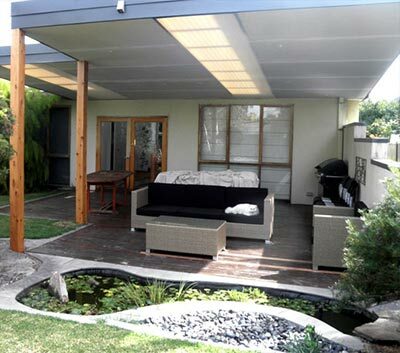 The space you have available under or near your Sydney patio needs to be taken into account. You might want to consult the whole family – you might like the idea of digging up the lawn to install a large rock pool but your footy-loving kids might have other ideas! You can get an expert in to install a water feature or you might want to do it yourself. If going the DIY approach, you can purchase ready to install features or, if you’re feeling bold and want a more individual feature, build your own from scratch by utilising containers, piping and a water pump. Make sure you consider safety. A deeper pond may need a grill installed to protect young children from drowning. And consider the placement of an electric power point for the pump. Think about integrating water-friendly LED lights with your water feature, for a focal point that looks brilliant even at night.